My series of #JapanTrip blog posts would be incomplete without mentioning Osaka, which is also known as The Gastronomics' City or The City of "Kuidaore". Kuidaore literally means "eat until you drop" or "stuff yourself until you can't eat anymore," which explains Osaka's food loving culture. (...I knew it! I see we have the same interest, Osaka.. :). But if you only have one night in Osaka like I did, look no more. Head straight to Dotonburi area in Minami (Namba), a really great place to soak up the atmosphere with thousands of the bright neon blazing up along the canal at night. 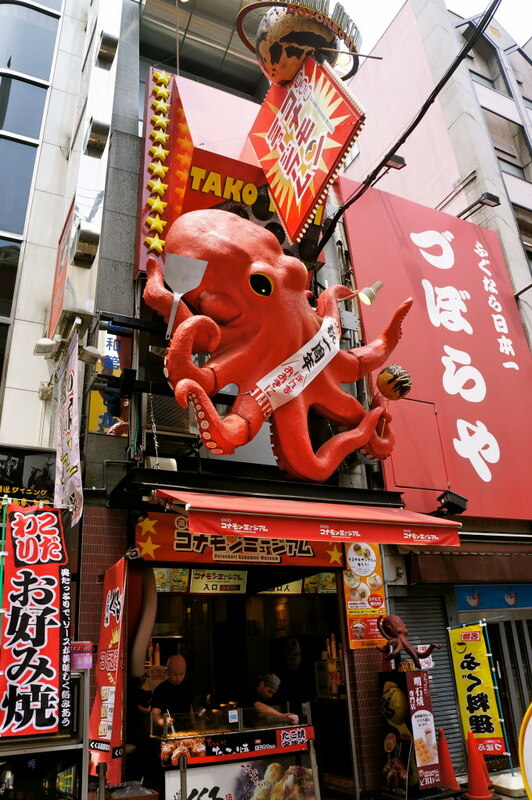 It's one of the most popular tourist's destination, with unbelievable number of restaurants and things to see, including what appears to be the landmark of Osaka: the super famous Glico Running Man sign and Kani Doraku giant crab sign. You haven't been to Osaka unless you took a picture under the Glico Running Man neon sign near the canal bridge! Kani Doraku in Dotonburi. Famous for its crab claw meat (but obviously not for those who are on a budget, though). Talking about Osaka's food, there are too many but of course the most iconic are Takoyaki & Okonomiyaki. These two are said to be the spiritual food of Osaka, it's what people commonly associated Osaka with. I met my friend who have been studying there for his masters' degree, and that night he took us for a night walk from Shinsaibashi station to Namba area, to find the best experience of eating both of the iconic foods. Okonomiyaki literally means ‘cook what you like, the way you like’. It's basically Japanese savory cabbage pancake, containing a variety of other optional ingredients, as the name suggests. The most popular filling is octopus, scallop, squid, shrimp and bacon. The light batter itself, uses a mixture of flour and special Japanese yam called 'yamaimo', which makes it really soft, gooey, and fluffy. That night, my friend took us to this restaurant named Mizuno, which turns out to be one of the most historical culinary place that have been serving its family recipe for over 65 years! Even CNN Travel also voted this restaurant as one of the BEST okonomiyaki places in Osaka. Well, that quite explains the 30-minutes lining up we had to encounter by the time we get there. It's a small place with only few seating on 1st & 2nd floor, and the location's quite tricky because it's tucked away from the main Dotonburi arcade, so I was glad I had my friend as our local guide so I won't get lost over and over again. I only remembered I had this super big grin on my face during the whole time queuing, and even the whole time the chef prepared our okonomiyaki on the iron griddle right in front of our table :D Definitely worth the wait because this is the best okonomiyaki I've eaten, so far! The 30-minutes queue was worth the wait. Maze-yaki, Miduno-yaki. ￥1,365. Standard mixed Okonomiyaki. We tried two types of okonomiyaki, the first one is the classic Maze-yaki (Maze means 'to mix'), but with noodle & egg below the mixture (almost looked like Hiroshima-style okonomiyaki), then topped with their secret sauce, mayonnaise and of course, their famous signature swirl of seaweed powder. The second one is Yamaimo-Yaki (around ￥1,575) which contains huge scallops and using yam in its batter mixture. I personally liked this one better (I call it "The Scallop Factor", lol), the addition of yam makes the texture more gooey and everything just MELTS in your mouth. I just can't stop eating these! Looking at the table next to us, at that time I also wanted to try their Kimchi-Yaki, but turns out it uses pork in its kimchi mixture. Had to be skip Korean' pajeon-like okonomiyaki this time. But still, Mizuno is very much recommended. Direction: 5 min. walk from Namba Stn. Metro Midosuji-line, 5 min. walk from Nihonbashi Stn. TIPS: come around 3-5PM if you want to avoid long queue. Everybody knows Takoyaki. Literally means 'fried octopus', this popular Japanese octopus-ball is made of flour-based batter with chunks of octopus, scallions, tempura scraps (tenkasu) and pickled ginger, then poured into special takoyaki pan and fried until golden brown, and lastly smeared with sweet brown sauce, mayonnaise, and dried bonito flakes (katsuoboshi) on top. Takoyaki has been famous in Osaka and the surrounding Kansai area since the early 1930's. What I saw different from other stall, Creo-Ru had this particular menu called Hanjuku Tamago to Negi Tappuri, which means 5 (or 6) lumps of takoyaki-ball buried underneath massive amount of negi (Japanese scallions), takoyaki sauce, seaweed powder, mayonnaise, and... SOFT-BOILED EGG. Like your cholesterol level hasn't rocketed yet, haha. And the deflated outer part complements the half-boiled egg very well. All great for mushy-mushy lover :p This costs around 600 yen a portion. ... SO... THE BEST TAKOYAKI? Later after my trip to Osaka, I went to Tokyo and stumbled upon this popular Takoyaki franchise chain named 'Tsukiji Gindaco', and surprisingly to me, this is the BEST Takoyaki I've ever eaten in Japan. Unlike the previous ones I had back in Osaka, in which the outer-part deflates very quickly & the inner gets too soft and runny; Gindaco's takoyaki balls are just perfect. When they say crispy on the outside, it really IS crispy, thanks to the method of pouring massive amount of vegetable oil while cooking at a very low heat - that makes them super crisp but keeping the inner dough cooked at the right consistency. Tsukiji Gindaco's Takoyaki. I regretted ordering only 6. The extra crisp on the outer is achieved by pouring more oil on low heat when pan-frying the takoyaki. It's the best damn thing compared to the deflated-outer & undercooked ones. As for now, I will end my story here. Remember, there is definitely more to Osaka than Takoyaki & Okonomiyaki. You always have plenty option to "eat 'til you drop", from kushikatsu (deep fried and breaded skewers), Hako-zushi (box pressed sushi), Kitsune-udon, Tecchiri (pufferfish hot pot) and a variety of crab dishes for those who don't mind the extra budget. 'Til we meet again, gastronomic's city!